We were sprawled across the grass and clover, savoring the summer evening's warmth and a decadent feast: curried local-vegetable stew, refreshing organic juice, and miniature rhubarb tarts dusted with sparkling sugar. No, this was not an Outstanding in the Field dinner, or a theatrical reenactment of Le déjeuner sur l’herbe. It was a Food Not Bombs event in downtown Portland, Oregon, in which a group of punks prepared a huge free vegan dinner and served it in a park. The vegetables and juice, which had just reached their sell-by date, were donated by a local market; the pastries were donated by a local artisanal bakery at closing time. The cooks had whipped up the curry in their communal house and hauled it to the park on bike trailers. [%image hangover float=right width=400 caption="Shoshanna's creation. "]We gathered like this a few times a week to eat for free, flirt, and find out about shows, house parties, and protests. I was 22 years old. Punk culture may have originated in music, but for us, it was as much about the food as anything else. We were eating dinner, but we were also making a statement: that our society was an excessive, harmful, and wasteful one, and we had a better vision. Why prostrate yourself to the rat race to put food on the table when so much of it is thrown away every day? In one bowl, we could free ourselves from the 9 to 5; stem waste; reduce animal suffering; and build community. Still, I agreed then and do now that the health, environmental, and animal-welfare issues associated with factory farming and the standard American diet are a big part of what’s wrong with our country. Vegan cooking was punk because it was a rejection of the status quo in favor of doing things the way we believed was right. Kramer's experience is typical of many who've been involved in the punk community. Yes, we partied, and yes, we hated the cops, but we were also passionate about creating community and seeking an alternative to the messed-up ways we saw people living their lives. Punk meant DIY, making something out of nothing: creating art, planting seeds that would become salad, trading zines and cookies, raising consciousness. Food was a big part of this, and a metaphor for the overall trajectory. Where others saw garbage, we saw dinner. When it seemed like there was nothing to eat in the house and nothing in our bank accounts, we could always scrape something together. Eating healthfully, putting food production in the hands of the people with gleaning and backyard vegetable gardens, getting together for potlucks to strengthen relationships — these were all part of reshaping society to be more sustainable and more free. 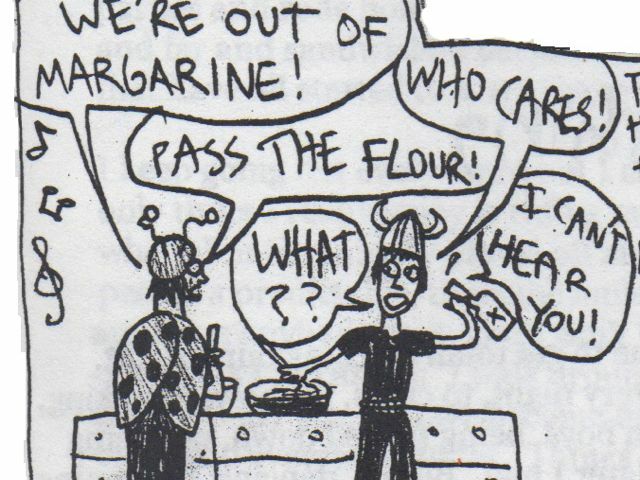 Punk vegan recipes are different from what you'll find in most vegan cookbooks. We didn’t have money, so we cooked accordingly, relying on cheap basic ingredients without a lot of fresh herbs or exotic produce. But we weren’t unique. Hippies have been eating veggie curry, black-bean burgers, and lentil soup since at least the 1970s. We were carrying on a proud lefty tradition of sticking it to The Man with a fork, uniting two enduring bohemian conditions: idealism and voluntary poverty. What we ate was shaped as much by practical considerations as by politics. I never gave up meat, but I ate rice and lentils anyway because I was broke (and didn’t know how to cook chicken). Our diets were mainly determined by what was cheap, what we could get for free, and what was available at the natural grocery co-op. What we referred to as “vegan mush" was ubiquitous, a common result of young folks with little kitchen experience trying to feed a lot of people with little money and a random assortment of ingredients. Vegan mush is an umbrella term for amorphous concoctions cooked together in a big pot and seasoned haphazardly with large quantities of cumin, nutritional yeast, and Bragg's amino acids. It came in a few basic genres: tofu scramble, curry, veggie stew, and rice-legume combinations. There were a lot of carrots, potatoes, and garlic. Sometimes it was really good; other times it was just . . . mushy. Some of the more domestically inclined punks transcended vegan mush, creating luscious meals of distinct flavors and textures, inspired by a multitude of ethnic traditions. In their hands, activist food was a bounty of nature, a show of skill. You'd have vegan food-stamp feasts featuring butternut squash stuffed with wild rice and pie made with blackberries picked on the side of the road. 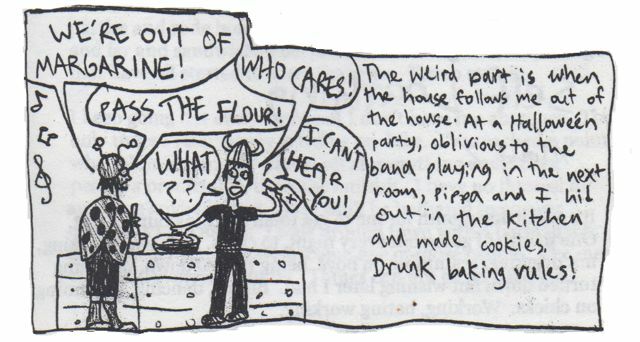 Some people wrote about their edible adventures in zines and online. I had been making (non-vegan) food zines with my best friend, Bianca James, since I was a teenager: photocopied collections of doughnut reviews, recipes, and info on eating for cheap. But I didn’t know a ton about home cooking, even after I moved out of my mom’s house and moved to Portland. When I got deeper into the zine scene, I was thrilled to learn that Bianca and I weren’t alone in our food fixation, and I began finding other zines with recipes for complex dishes like pad thai, Israeli shakshuka, and homemade seitan. They inspired me as I gradually learned how to cook more than French toast and spaghetti, and how to experiment with whatever I had on hand. 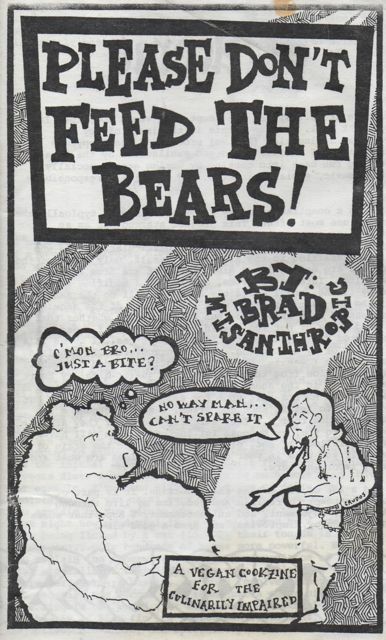 One of my favorite zines was Brad Misanthropic's Please Don't Feed the Bears, which combined tofu-scramble recipes with death-metal-band recommendations and philosophical musings. Here I found my favorite chocolate-chip-cookie recipe ever, made with maple syrup instead of sugar. Soy Not Oi! by the Hippycore Krew was also popular, and not just because it had cute illustrations (although that’s why I liked it). “Way before Fast Food Nation, 'Food Inc.,' and so on, Soy Not Oi! was connecting food politics to the larger world as well as our smaller, social worlds,” Moskowitz writes on her website. 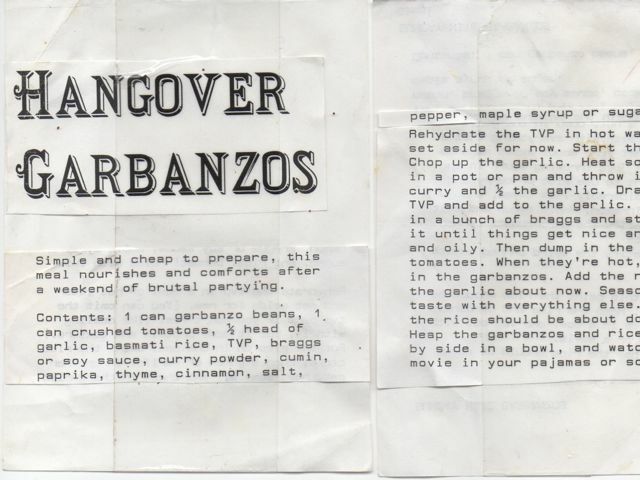 These zines showed not just how to cook, but why. Moskowitz, who began taping '"The with Terry Hope Romero in Moskowitz's tiny Brooklyn kitchen in 2003, started cooking years before that, entrenched in the punk-activist scene. On her show, she demonstrates how to roll vegan sushi and make chocolate-Grand Marnier cupcakes with orange-zest frosting, while joking around with Romero and looking eerily like a tall version of myself in the early 2000s. Kramer's book “vegan” as a zine, too. “We photocopied our 50-page zine at a local print shop and bound the zine in my living room,” she says. “We gave it away to about 50 friends, and they all loved it, so we made another batch and sold them at punk shows and via the Internet.” The book contains recipes for everything from ambrosia salad to toothpaste and dog biscuits. Activist food culture is based in idealism, but also in anger, dystopianism, and fear — fear of environmental degradation, corporations run amok, disease, biotechnology. Some people in the punk-vegan scene gave up not just animal products but corn (GMO concerns), packaged foods (corporations), and produce from out of state (pollution). We picked berries by the abandoned factory not just because it was free food, but because it let us imagine we were finding treasures in the rubble of a collapsed society: the persistence of nature in an urban wasteland. Of course, not everything was as simple as our reductive politics made it out to be. There was the obvious fact that we were a bunch of privileged, employable white kids who chose not to work much or at all, often accepting food stamps from already-strained social services, and judging others for their unhealthy eating when they might simply have lacked the resources or education to choose better. We hated corporations and processed food, but we sure bought a lot of soy milk and Tofu Pups from Trader Joe’s. What about “freegans,” who shopped vegan but ate anything they could get for free? Even if we could eliminate animal suffering, what about the suffering of the farm workers who grew all the produce we ate? And then there was the unspoken Catch-22 of the whole enterprise: If we succeeded in eliminating corporate waste and crushing the government in favor of anarchy and freedom, where would we get our free bread and Odwalla juice? We argued all the time over what was just and what was punk. People made some weird choices. But at its best, our ethos taught us to stop being so self-destructive, to take care of ourselves and one another, to take matters into our own hands, and to build something positive. In recent years, political food awareness has gone mainstream. Bill Clinton has become a vegan, Women’s Health magazine is publishing articles on the locavore movement, and the New York Times' Mark Bittman, one of the country's most influential food voices, slams the standard American diet on a weekly basis, telling readers to grill watermelon burgers instead of meat. If that’s not punk, I don’t know what is. Some of the original vegan-punk zinesters are now making a living from their cookbooks and websites. How It All Vegan! has sold nearly half a million copies. “The cookbook took off in a way I never imagined,” Kramer says. “I thought we’d be lucky to sell a few thousand copies, and what happened instead is How It All Vegan! has become the best-selling book \[our publisher\] Arsenal has ever sold.” Its sequels, [%amazonProductLink asin=1551521288 "The Garden of Vegan"] and La Dolce Vegan!, also became bestsellers, and Kramer now runs Sarah’s Place, a vegan curio shop in Victoria, B.C. Isa Chandra Moskowitz has published six cookbooks, some of which have become bestsellers, including Veganomicon. The Post Punk Kitchen website has become a cult phenomenon among all kinds of cooks, not just vegans and not just punks (or post-punks). Veganism and socially aware eating are everywhere, and I haven’t heard anyone complaining about it not being cool anymore now that everyone is doing it. Now, nearly a decade after my Food Not Bombs days, I work all the time and I buy all of my groceries. And, frankly, I eat a lot of meat, because it gives me the energy and brain power that being a grownup requires. But what I gained in my Dumpstered salad days continues to inform my perspective on food and the decisions I make. I still find it hard to refuse any kind of free food. I recognize the value of preparing and eating meals with friends. I try to use fresh, organic ingredients when I can, but I know that if I eat some plasticky Safeway lettuce that’s been in the fridge for a week, I’ll probably live. I'm still strapped for cash — it's still a choice. And I often find myself doing a familiar dance: open the cupboards to see if anything’s in there, pull the last sad veggies and slice of cheese out of the fridge, soak some beans, gather some spices, pick up the phone to invite someone over, and make something out of nothing.